On an exquisite afternoon for Bike Fun, the final Poky Pizza Pedal of 2014 provided its customary blend of bicycling and pizza. This past Wednesday, thirty-one Poky Pedalers gathered at Point Area Bicycle Service from where we rode off. Our 4-mile route snaked around the neighborhoods north of downtown. We enjoyed beautiful sunny skies as we rode calm streets and non-motorized paths past numerous lovely homes and Stevens Point’s illustrious riverfront parks. Upon returning to downtown, our pizza destination was Arbuckles on Strongs Ave, directly across the street from our starting location. 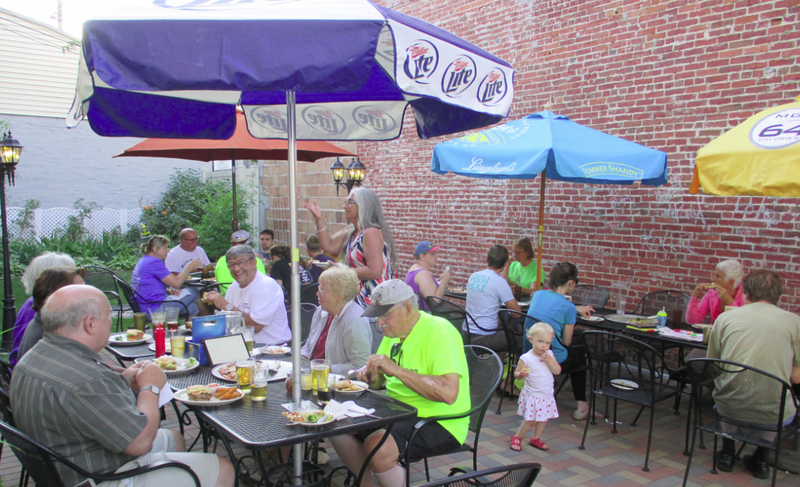 Their outside patio was available, so we were able to share food, beverages, and conversation in an alfresco setting on a pleasant late-summer evening. I want to heartily thank the staff at Arbuckles for gracefully accommodating our large group of Poky Pedalers. Our Bike Fun was greatly enhanced by your efforts. Unfortunately, this was the last Poky Pizza Pedal until next year. This was the first year of pizza-themed Bike Fun with PPSP, and these monthly events were very well received. Poky Pedalers can rest assured that these popular rides will be back in 2015. But don’t dwell too long about all this, because our next Poky Pedal is coming up soon. There is still plenty of Bike Fun to share in 2014 with Poky Pedals continuing through October. Check out the Upcoming Poky Pedals page and the 2014 Bike Fun Calendar for info about all the Bike Fun still to come this year.